Sometimes the best things do come in small packages. 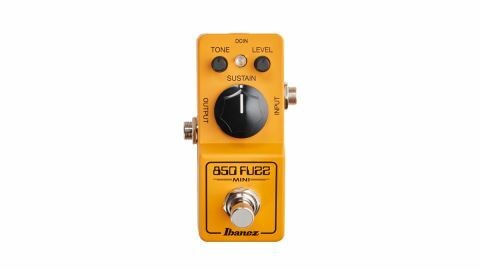 The Ibanez 850 fuzz is an adorable mini version of its recent reissue of the classic distortion box, the Ibanez OD850. The matt orange is gorgeous and the sounds are to die for. Originally a re-badged Maxon clone of a 1973 ‘violet’ era Ram’s Head Big Muff made for Ibanez with a couple of tweaks, the OD850 had a slightly more useful tone stack and crunchier character that set it apart from its muffy cousins, making it a collector’s piece. This mini reissue is ideal in terms of pedal board space, but it has modern features like a centre negative powerjack as well. Dime the sustain and disappear for days.